It is amazing what happens when we trust kids with their own ideas. That&apos;s why we created this robot DIY kit- to inspire young kids to imagine and build their own inventions. Children are happiest with their hands and minds are working together – they&apos;re having fun, and they&apos;re also honing their hands-on creative problem-solving skills. 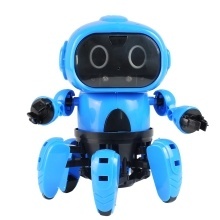 Fun Modes: The robot has following mode and infrared obstacle avoidance mode. Material: Extremely durable, plastic, safe and non-toxic materials make up each piece of this toy. Easy to Build: Children can figure out how to build this toy within an hour without parents&apos; help. Enhance Ability: Use these complex DIY kits to build a robot needs a correct logic thinking way, good hands-on ability and problem-solving skills. Your kid&apos;s ability will be improved through this building process. Ideal Gift: Best fun toy and educational toy gift for kids and also can be decoration on the desk.